Consider the task ahead of Meriwether Lewis and William Clark as they set off up the Missouri River on May 14, 1804. In addition to incredible dangers and challenges of penetrating an unknown continent, and the mental rigor of conducting scientific research, they were tasked with delicate diplomacy. Dozens of Indian tribes lived along the Missouri and Columbia Rivers; many of the people had never before made contact with a white person. Lewis and Clark were supposed to meet the leaders of these people, make friends with them, and convince them that the Americans were “all that”; unlike, say, the British and Spanish. Fortunately for Lewis and Clark, there were a few established tricks of the diplomacy trade. The Americans generally exchanged gifts with the tribal leaders. William Clark, who later earned his living as an Indian diplomat, eventually received so many pipes, robes, and other memorabilia that he opened his own museum. 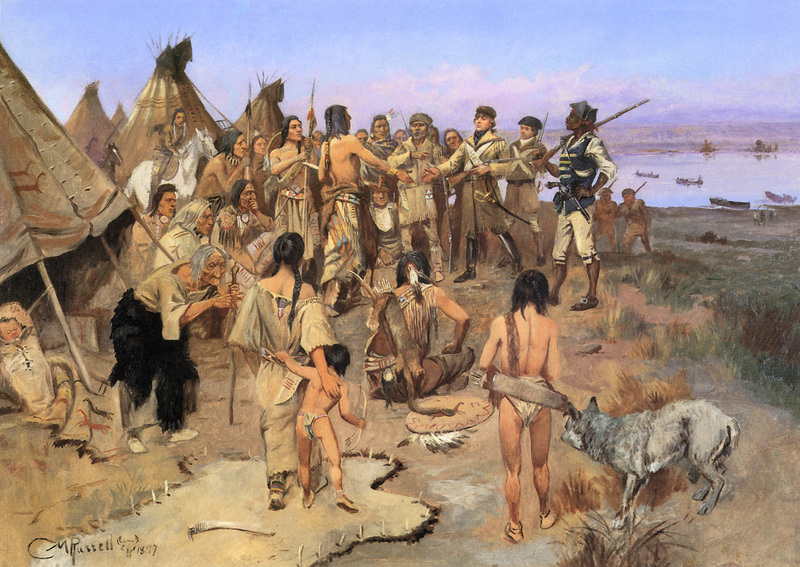 In return, Lewis and Clark had gifts for the Indians, including beads, American flags, woven clothing (much preferred over animal skins), and a special token of recognition known as a peace medal. Peace medals dated back to the days of the British crown, when representatives of the king would hand out large silver medals bearing the king’s likeness in order to cement friendships with tribal leaders. When the Americans won their independence, peace medals had become a well-established tradition, and new editions were created bearing the likeness of George Washington, John Adams, and, by 1804, Thomas Jefferson. A few Lewis & Clark medals survive. This is the one presented to Yelleppit of the Walula people. Oregon Historical Society, OrHi 100141 and OrHi 100142. The Jefferson peace medal, made of hollow silver, had a new design which was so simple and striking that it remained the standard for the medals until 1849. On one side was a bust of the president’s likeness. On the other, a pair of clasped hands and the words “Peace and Friendship.” While tinged with bitter irony today, the words and image fit the conception Jefferson had of the Indians he expected Lewis & Clark to meet. With no awareness of the technological revolution in steamboats and railroads that would supercharge westward expansion, Jefferson believed the Indians would be part of the power equation of the west for decades or even centuries to come. They were equals, or at least had to be treated as such. Peace medals were prized possessions among the Indians. They became tokens of hope in the face of tragedy. 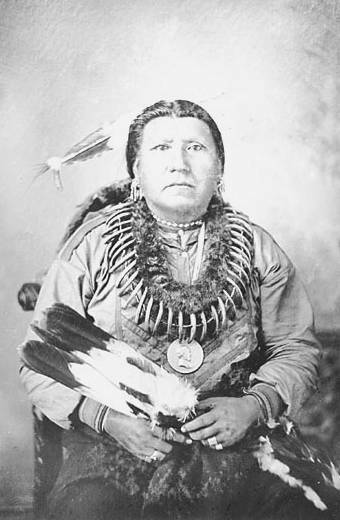 This photo shows Boss Sun of the Pawnee wearing his medal. The government continued to strike and hand out peace medals through the presidency of Benjamin Harrison in the 1890s. A wonderful display of peace medals can be seen at the Museum of Westward Expansion beneath the Gateway Arch in St. Louis.